After the botched attempt of selling the team by BMW, fortunately Peter Sauber was willing to step into the void in order to save his beloved F1 team last year. 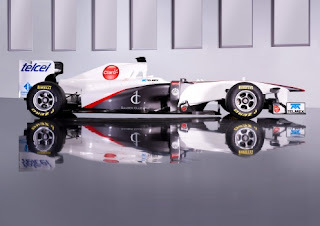 Thus, after a somewhat perilous 2010 season, albeit with brief flashes of success shown by the Japanese Hard Chargin’ rookie “K-Squared,” (Kamui Kobayashi) the team is now in mucho better financial status thanks largely to its new found Mexican connection with Billionaire Carlos Slim. This relationship was cemented with the promoting of Mexican GP2 driver Sergio Perez to the teams second race seat; who brings his celebrated TelMex sponsorship to the fold – leading to other Mexican companies joining the Fiesta, most notably Tequila Drinks maker Jose Quervo. Meanwhile Kobayashi now graduates to the team leader role in his second full season of Formula One, whilst rising Mexican Hot-Hot-Hot! ‘Schu Esteban Gutierrez is elevated to the team’s test/reserve driver role. Gutierrez, the reigning & inaugural GP3 Champion will now contest this year’s GP2 season as he seeks to work his way into a fulltime Gran Primo Piloto ride in the near future, whilst serving out his third driver team role.